The comic is professionally graded by CGC as a 9.8 and the actual item is shown in the picture. The CGC slab is brand new with no scuffs or scratches on the plastic. 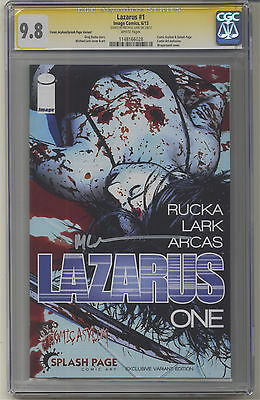 This auction is for a CGC certified signature series signed copy of Lazarus Issue 1 Comic Asylum/Splash Page Comic Art variant by artist Michael Lark. The shipping cost will be $12.50 for US bidders using USPS Priority Flat Rate packaging. When emailing about specific shipping questions, please provide your zip code, or country. USPS First Class International shipping will be $58.00 US Express. Please note that I will not be responsible for lost international shipments or items held by customs. Combine shipping on multiple orders for US customers Only! My preferred method of payment is Paypal.